John F. Simon Jr.'s second solo exhibition in New York was presented by Sandra Gering Gallery at its former Chelsea location. For this exhibition, John Simon extended his creative process by using original software to mark and shape physical materials. The code Simon writes is now articulated outside of the computer screen through the use of a digitally controlled laser. With the laser, Simon alters materials that are well known, but are new to his body of work. This "new media" includes Formica, Linoleum and Plexiglas. New Instructions is composed of four groupings of work that point to a common cultural ground of patterning and symmetry. 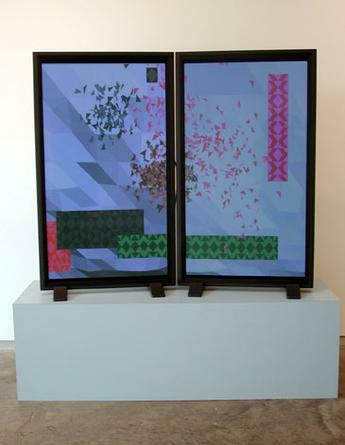 In Simon's screen based work, Swarms, one software program is presented simultaneously across a broad window comprised of two 50" plasma monitors. The software shows the formation and dissolution of symmetric patterns as a metaphor for the temporality of our thoughts, ideas and actions. The process of gathering and dispersing patterns is continually reenacted by up to nine swarms forming a mesmerizing variety of compositions and color combinations that will never repeat. 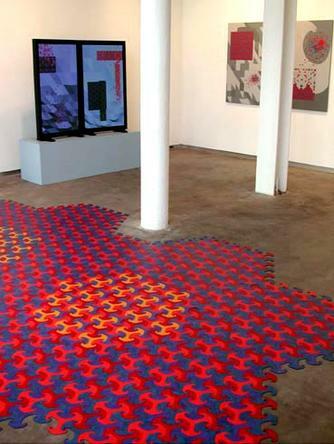 For the gallery floor, Simon created a symmetric pattern of almost 1,000 individual laser cut Linoleum tiles, inspired in part by an M.C. Escher drawing from the Alhambra. 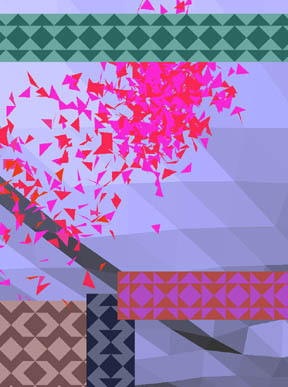 Simon's floor piece is a digital improvisation of this centuries-old interlocking style. He brings to the basic symmetry curvaceous shapes that are characteristic of computer-based design. Simon has also used the laser to create Plexiglas panels with which to "tile" the gallery windows. These pieces screen the view of the outside world while coloring the light entering the gallery. Both in function and in composition, the Plexiglas panels express Simon's interest in the nature of boundaries. 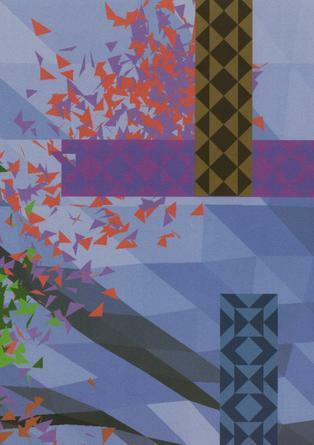 Finally, Simon captures moments of the Swarms software in four works of intercut Formica. The fleeting, beautiful screen stills are translated through a variety of carefully chosen and controlled laser cuts and marks.